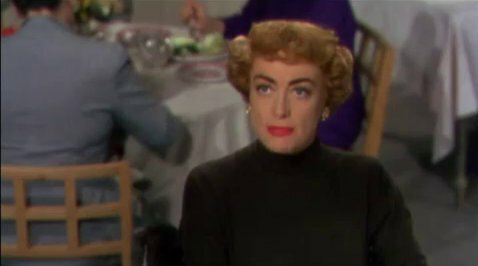 I’m assuming that there was a time when Joan Crawford didn’t resemble the cartoonish hag that Faye Dunaway portrayed her as in Mommie Dearest. By the time Torch Song was made however, that time had sadly passed. Here you had Crawford portraying a Broadway star who acts like a complete jackass, is obviously insecure about herself and has this weird relationship with her mother that at times seemed very destructive and at other times seemed to help her a great deal. 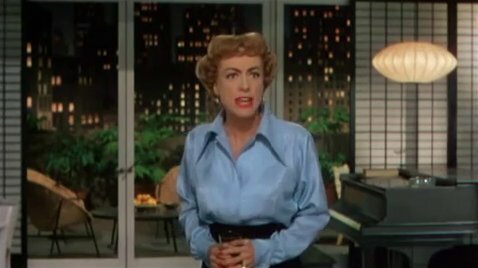 You also had the distinct pleasure of Joan overacting in each and every scene, her giant eyes and big snarling lips competing with her day-glo hair to see which would be more annoying to the viewer. She also liked to show her forty-something year old legs off at every opportunity. Thanks granny. The movie itself makes you wonder what MGM was thinking when they brought back her from her exile at Warner Brothers to do this movie. 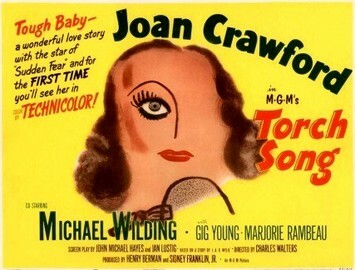 It is as unpleasant and gaudy as the make up Joan wore in this film. 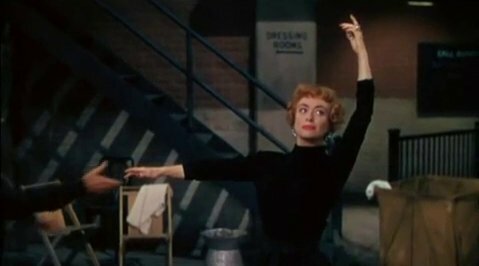 I know that she’s supposed to portray a self-centered jerk and that she supposedly learns to be a better person from a blind guy, but her conversion to loving person was so fast and unexplained it just rang as false as the wigs Joan periodically donned. The film begins as Joan is rehearsing for another big show that her character, Jenny Stewart, is going to be starring in. Jenny is a Broadway star who still packs ’em in on that Great White Way, but she’s a holy terror to everyone she works with. She constantly yells and criticizes everyone around her, but refuses to accept any criticism. She also finds a way to harass the pianist who’s arranging the songs, constantly reworking them and having the guy learn all the new stuff she wants to put in each and every (awful) number. Eventually this guy gets fed up and quits on her. He’s replaced by a blind guy named Tye and he has the patience of a saint. He’s also able to remember everything that Jenny demands in the way of changes and is able to incorporate that into his playing. He’s even such a genius that he can make suggestions to her to improve the song and dance numbers that are perfect! Jenny wants Tye fired though because she doesn’t want someone telling her how a number should be done. After getting him fired, she mopes around a lot because she’s in love! It’s really quite ridiculous to see her stomping around demanding that Tye come back and to have her coming over to his apartment and announce to him that he’s been re-hired only because she bet somebody that she could get him to come back. Jenny tells her money-grubbing mother she’s got man trouble so ma hauls out the scrap book and locates a review that uses a phrase (gypsy-madonna) that Tye had just used in a conversation with Jenny earlier. What’s this? The review was written by a guy named Tye? And it was written before he was blinded in the war when he could see the lovely and talented Jenny? And it says that Jenny is mega awesome? Hey, I guess Tye is okay after all because it turns out that he has basically been stalking her the whole movie. He even paid off the old pianist to go to Cuba so that he could be with Jenny! The major problem with Torch Song is that Crawford is so unbelievable and over the top in her portrayal of this woman that you just sit back and wonder what this Tye character could have ever thought was decent and worth loving in her. Nothing really rings true about Jenny Stewart and it all resembles so much grandstanding by Crawford. Look at me scream! Look at me scowl! Look at me put down blind people! If you’re watching this hoping for musical numbers you’re screwed as well. There aren’t hardly any full blown numbers and the one or two there are just make your bowels lurch. None of them stick with you, but I do remember Joan in blackface and singing something about being a two-faced woman. That’s how this movie treats this character. I mean there’s no other reason why he’s blind except to contrast his goodness (because he’s able to go through life bearing that cross) with her suckiness. If they wanted to have a character who happened to be blind, fine. Then don’t play it up every chance you get. Or if you want to show me that blind people act just like everyone else, that’s good too, but I don’t need to see these all-wise, saintly handicapped types running around everywhere so that our “star” can be rehabbed by them. One final point is that the movie is in color and in 1953 that meant showing off by having everything you can imagine in gaudy colors, from Joan’s lemon yellow robe, to green walls, to these weird blue suits the guys wore. It all fit right in with the entire artificial and tacky flavor of the proceedings.